The statistics were all against my husband and me when I was in my late 30's, despite the new options at our disposal once we decided to go the route of infertility treatment. As time went by, and we spent more and more money without results, it was hard not to to be depressed. But the prefix 'in' of 'infertility' can mean (rather than not fertile) exactly what it says: inside, in the middle of, surrounded by, which means fully absorbed in and committed to, in this case, having a baby. Try to think of infertility this way. Couples who struggle to achieve a viable pregnancy struggle with the part of family-building that should be the easiest and certainly the most intimate and private. I first got the idea for the All-Weather Friend while entrenched in this painful world. It has taken many years to reconcile what did and didn't happen to me. My own mother and obstetrician father didn't seem to get it, much less my friends. I can hardly write about that time in my life without reliving the sense of alienation from the people who were closest to me and from whom I most needed compassion and understanding. 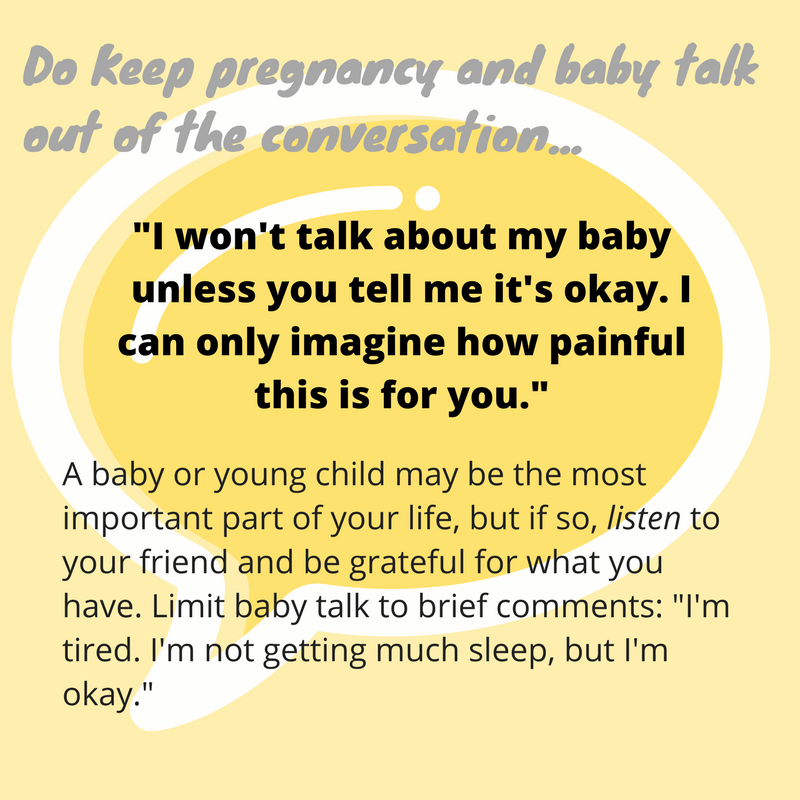 The All-Weather Friend page on infertility is a forum where you can find answers, share stories and blogs, suggest ways friends and loved ones can be supportive, ask questions and connect with a sympathetic community. Send blogs, links for the resource page, suggestions and questions. You can email mary@allweatherfriend or click Connect on the top nav bar and use the form you'll find on that page. Infertility seems to invite people to say and do unintentionally hurtful things. Maybe it's because there isn't an obvious injury or irreversible loss. Maybe it's because friends expect the situation to be resolved, hopefully in a happy way: You'll either get pregnant, or you'll adopt, or you'll learn to appreciate the childfree life. It's natural and right for parents to be captivated by their own babies and children—so much so that the pain of not having a child or knowing whether you ever will, while constantly confronted by those who do, is impossible to imagine. 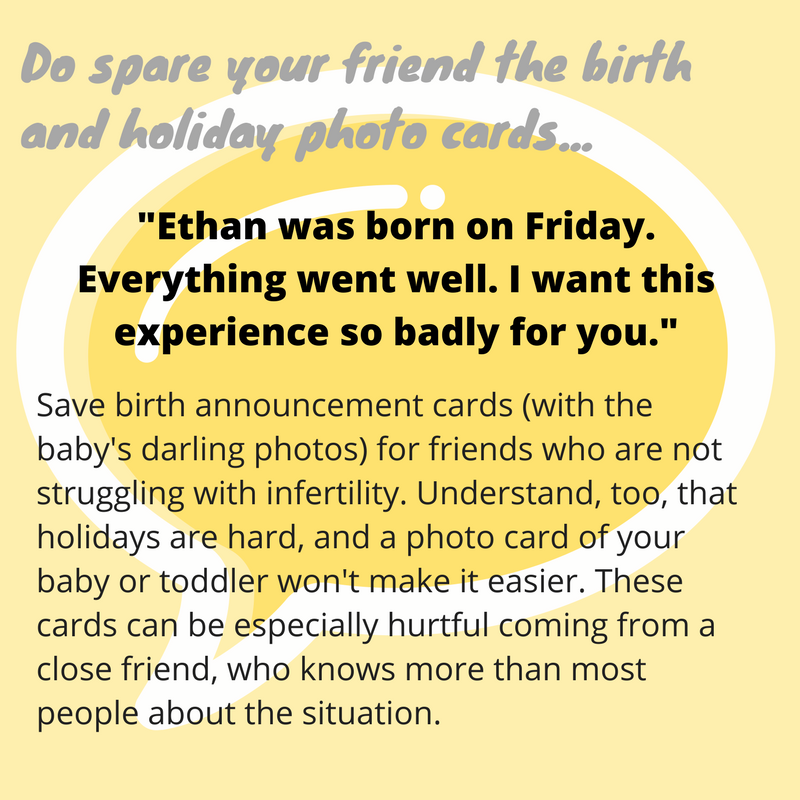 Click the arrows for some do's and don'ts of friendship with couples coping with infertility.